Transparency Market Research (TMR) states that the global gravure printing inks market is fairly consolidated. “The market is led by top six players, who reportedly held a share of about 75% in the market in 2015,” states the lead author of this research report. However, these players, Flint Group, Sun Chemical Group, Sakata INX, Toyo Ink Mfg. Co. Ltd., Huber Group, and Siegwerk Druckfarben AG & Co. KGaA, are expected to grow at a sluggish rate in the coming years as the industries are being challenged by the radical changes in technology, consumer behavior, and economic developments. To overcome these roadblocks, companies are expected to focus on research and development activities, investments in development and production of digital printing inks, and inorganic expansions. According to the research report, the global gravure printing inks market was worth US$1.8 bn in 2015 and is expected to pace ahead at a CAGR of 3.98% between 2016 and 2024 to reach a valuation of US$2.6 bn by the end of 2024. The dramatic rise in printing and publication activities across the globe are expected to drive this market in the coming years. The applications of gravure printing inks are seen in areas such as food packaging, furniture laminates, wallpapers, wrapping papers, greeting cards, newspaper, and magazines among others. Analysts at TMR expect that the packaging industry will lead the global market as industrialization and transportation of goods due to the emergence of e-commerce gains momentum. On the other hand, the publication industry is expected to show a decline over the coming few years due to the increasing demand for e-books and digitized papers. Meanwhile, the solvent-based gravure printing ink product segment is expected to rise at a CAGR of 5.0% between 2016 and 2024. 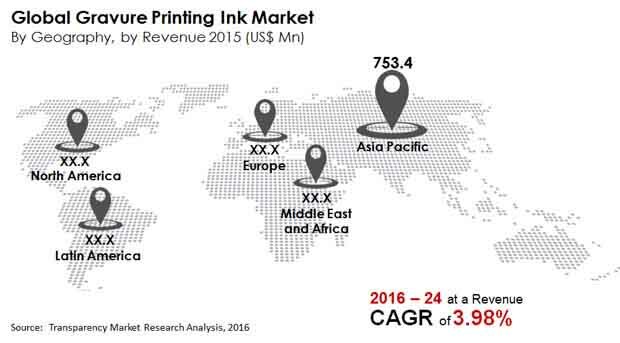 In terms of geography, Asia Pacific is estimated to picking up stream for sales of gravure printing inks market. The regional market is projected to surge at a CAGR of 3.98% over the forecasted period. The economic development in the region and the terrific rate at which businesses are booming are expected to drive the Asia Pacific gravure printing inks market. The global gravure printing inks market is being driven remarkable improvement in GDPs of several developing countries and the changing consumptions patterns of developed countries. The changing approaches toward packaging, innovative methods of packaging, and printing have given the global market a major impetus. The preference for gravure printing due to their ability to print on thin films such polyester, PE, nylon, and OPP have also bolstered the growth of the overall market. On the downside, the global market for gravure printing inks is being rattled by the strong presence of e-commerce industry. The growing usage of flexographic printing is anticipated to be a major roadblock for the overall market as it requires lesser manpower. Advantages of flexographic printing such as lesser ink consumption and quicker changeovers are expected decline growth for the global market. The increasing popularity of e-books with devices such as Kindle are expected to considerably hamper market growth as they completely eliminate the need for printing and publications.